She could have used a brighter lip and some bling though. I'm not a fan of her or the dress. The color and cut of the dress look great on her. Why a top knot, Colbie? For Cyndi, I guess this is ok. The jacket is just too much. Just cut your hair already. I'm not sure why he wore this hat, but it definitely had everyone talking. I bet he braids his own hair. Say what you will about the robot heads, but their tuxes are nice. And how about those awesome boots! Her hair, makeup and dress are just too matchy. I love them, but they need some fashion help. Anna's dress is cute but I agree she needs brighter make-up and some jewels are needed. Kathy Griffin - she looks awful, and a lot like Reba McIntyre here. "Fancy"
Colbie - not loving it at all. Cyndi - fits her totally. 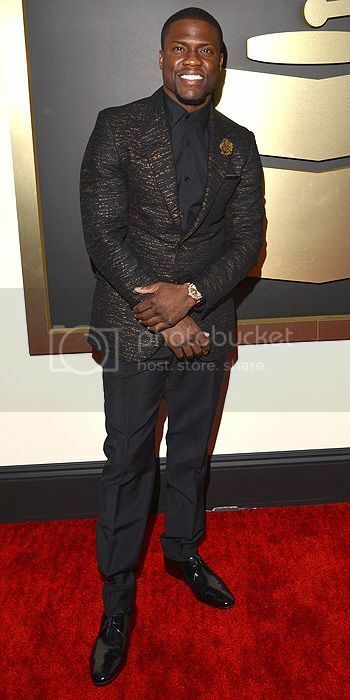 Kevin Hart - the jacket is loud, but so is he. I think it totally suits him. (And it's much lighter than Leather which I can imagine him wearing. Billy Ray Cyrus - grow UP already! Keith - looks handsome, not really a fan but he does look handsome. I like his hair. 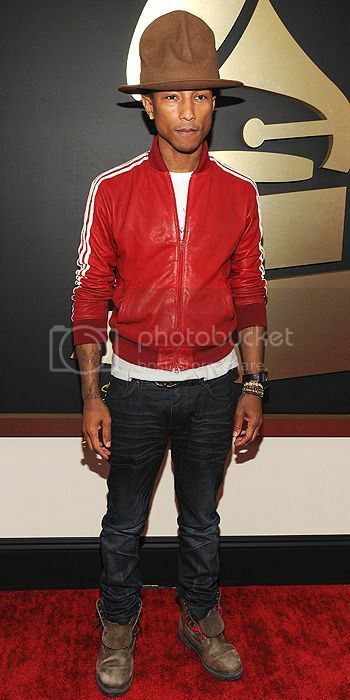 Pharrell - wins for biggest WTF? Willie Nelson - can do no wrong. I adore him, braids and all. He's what this is all about - being yourself. Steven Tyler looks like he's trying to channel Johnny Depp. 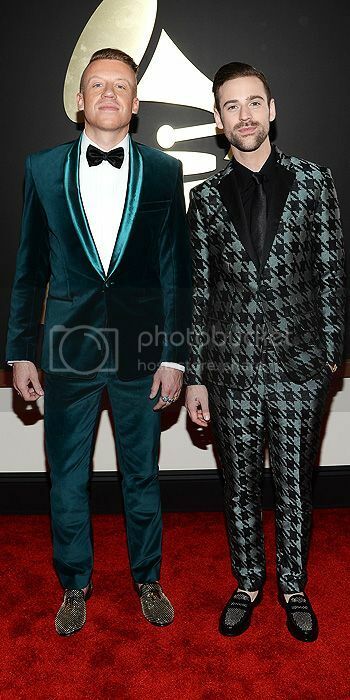 Macklemore - that is one green suit but totally suits him - and I have to say I really love Ryan's suit. It's a houndstooth thing - I didn't see their shoes on TV, fabulous!!! Daft Punk - they own their image and I like that. I totally wanted to hear them accept their awards in a robot voice though. Apparently they never take these off - in public. (I just thought after that statement about them mowing their lawn with the helmets on, and laughed). They are crazy but dapper at the same time. I like it. Jamie - I love that his tux is navy. Amber Rose always looks like a mannequin to me - I think it's the short hair, and now with all the same tone everywhere. Wiz is just strange to me. Robin - meh... s'alright. Paula, not loving. PS My sister-in-law was at the show last night. 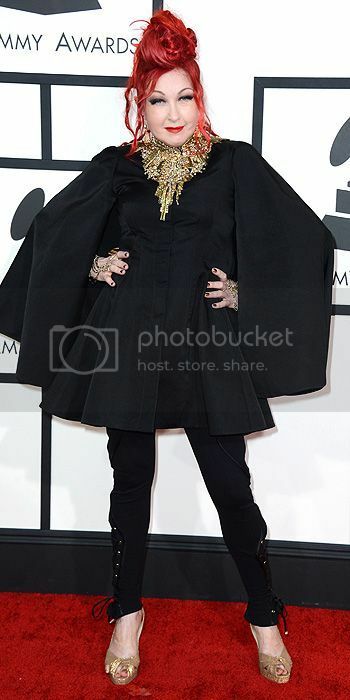 She goes to the Grammy's every year. There were some great outfits last night, but the only one here I really liked was Colbie's. Cyndi has way too much white powder on her face. Pharrell can do no wrong in my book, ever. I love Daft Punk and the fact that they always wear helmets. It's nice that they can be so successful. Kinda like the Gorillaz. Jamie Foxx's daughter is gorgeous. I think my best dressed male is Marc Anthony. Jared Leto isn't on here, but I was jealous of his highlights. Haha! Last night was soooooo good! I think it was one of the best shows in awhile. And I must add that both Taylor Swift and Miranda Lambert looked crazy gorg! Anna Faris is too skinny. Colbie Caillat just looked off, maybe it was the top knot?? 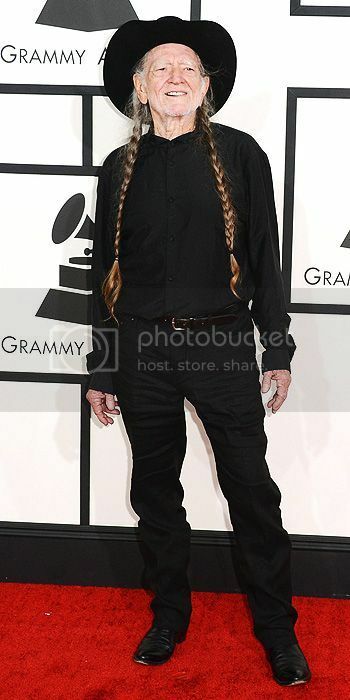 Did NOT understand Steven Tyler's facial hair. 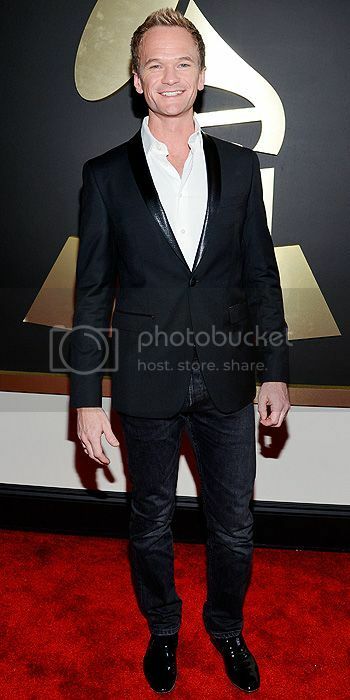 I liked Macklemore's tux but not Ryan Lewis'. My favorite maternity dress is houndstooth so hopefully I don't look that busy in it (although who knows if I'll ever get to wear it again, ha). 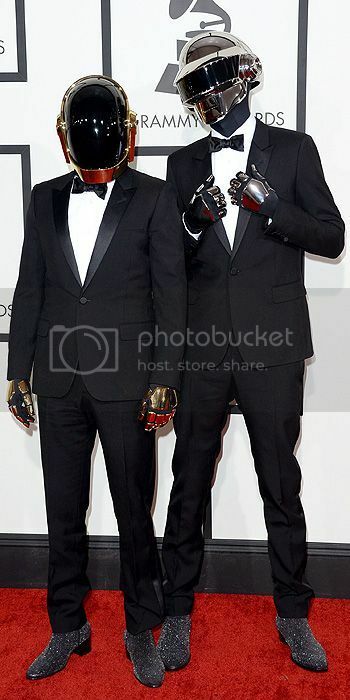 Does Daft Punk always wear helmets or was it just a thing for the Grammy's? I was so confused. Pharrell's hat looks like it should be on the head of a Canadian Mountie. Just saying.